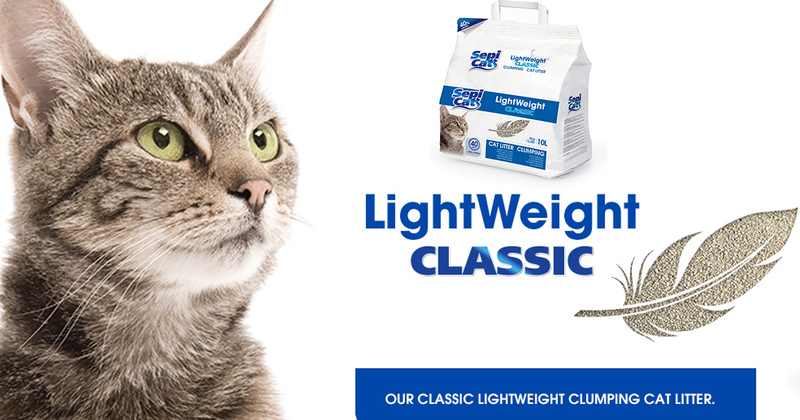 This isn’t the first time I’m telling you about all the good things Sepicat Lightweight cat litters have to offer, but I have just fallen in love with them, and it’s hard for me to get them off my mind. This time, I’d like to show you the great reasons why we consider Sepicat Lightweight Classic to be a true state-of- the-art classic. Just like the entire Sepicat line, Sepicat Lightweight Classic is a cat litter with amazing clumpability. In my opinion, it’s like the Frank Sinatra of cat litters, with its great presence, elegance and smoothness….its great finesse. It’s perfect for all long-haired cats, and that’s because of its granules being a bit larger than usual so they won’t get tangled in your cat’s fur. Just picture us stepping out of our litterbox with a pound of cat litter stuck to our paws and tail. Oh please, no! As is true for all Sepicat litters, this is an environmentally responsible product according to the study conducted by PWC-Ecobilan. Because we cats are also ecology-minded, respecting the Environment is something that suits us to perfection. Now then, taking your pocketbook in mind, I’ve got some good news for you. Sepicat Lightweight Classic cat litter is so effective that it requires fewer litterbox changes, so you’ll wind up saving a good bit of money without skimping on the quality of our care. Sepicat Lightweight Classic lasts up to 40 days longer than any other conventional cat litter! You can get Sepicat Lightweight Classic in two formats: 10-liter and 20-liter bags. And since it lasts so long, you won’t have to be carting around a lot of weight time and again to keep our litterbox clean and tidy. So, as you can see, using Sepicat Lightweight Classic is really easy and convenient, so we’re killing two birds with one stone. On one hand, your cat will be happy with its litterbox and, on the other, you’ll be getting greater efficiency from the quality of this litter. Every time your kitty uses its litterbox, the litter will form compact clumps easy to remove with the special scoop provided. Keeping the bathroom clean and tidy couldn’t be easier!